Remember the pro-abortion "papal" "knight," Rabbi David Rosen? Come on, try. Try. All right, let me help you. It was to Rabbi David Rosen that Walter "Cardinal" Kasper, the President of the "Pontifical" Council for Promoting Christian Unity and the head of Commission for Religious Relations with the Jews, wrote a letter on February 13, 2008, to assure him, Rosen, that Ratzinger/Benedict's "revision" of the Good Friday prayer for the Jews in the modernized Missal of 1962 did not signify that the Catholic Church had any mission from God to "take Israel's salvation in our hands" before the end of time. Remember that letter? I contended at the time that "Cardinal" Kasper would never have acted unilaterally, that is, without a consultation with the ecumenist and Talmudic sycophant, Ratzinger/Benedict, before sending that letter to Rosen. Others shot back by saying that such a conclusion was a "rash judgment," an interesting accusation as Kasper repeated, almost word-for-word, what he wrote to Rosen in an article published in a German newspaper before it was republished in the semi-official newspaper of the Vatican, L'Osservatore Romano eight months ago now. As far as I know, and perhaps I have missed a few things, the views Kasper expressed in his letter to the pro-abort vegetarian David Rosen and in his article about the Good Friday prayer have not been repudiated by Ratzinger/Benedict. Indeed, the authors of an out-of-print book, published in the year 2002, discussed the fact that Kasper was never contradicted or rebuked by Karol Wojtyla/John Paul II for his "views" about the Catholic Church's not having a mission to convert the Jews. Similarly, Ratzinger/Benedict has never contradicted or rebuked his fellow countryman, Kasper. VATICAN CITY - Pope Benedict on Thursday told Jewish leaders he was seriously considering freezing the sainthood process of his Nazi-era predecessor Pius XII until historical archives can be opened, a Jewish leader said. Some Jews have accused Pius, who reigned from 1939 to 1958, of turning a blind eye to the Holocaust. The Vatican says he worked behind the scenes and helped save many Jews from certain death during World War Two. 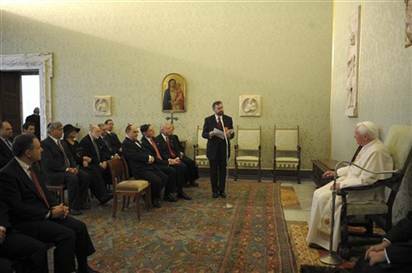 Rabbi David Rosen, a leader of a Jewish delegation that met the pope on Thursday, said the subject came up in conversations after formal speeches were delivered. One member of our delegation told the pope 'please do not move ahead with beatification of Pius XII before the Vatican archives can be made accessible for objective historical analysis' and the pope said 'I am looking into it, I am considering it seriously'," Rosen told reporters. Beatification is the last step before sainthood in the Roman Catholic Church. Some Jews have asked the pope to hold off on beatifying Pius until more information on his papacy can be studied. Pius did not come up in the formal speeches between the pope and Rosen, but the Jewish leader did repeat a request for the Vatican archives to be open for study. "We reiterate our respectful call for full and transparent access of scholars to all archival material from the period, so that assessments regarding actions and policies during this tragic period may have the credibility they deserve both within our respective communities and beyond," Rosen told the pope. A Vatican statement said another six or seven years of preparatory work would be needed before the archives on Pius' period could be opened to scholars and the pope would have the final decision. At issue is whether Benedict should let Pius proceed on the road to sainthood — which Catholic supporters want — by signing a decree recognizing his "heroic virtues." This would clear the way for beatification, the last step before sainthood. Benedict has so far not signed the decree — approved last year by the Vatican's saint-making department, opting instead for what the Vatican has called a period of reflection. The Vatican says while Pius did not speak out against the Holocaust, he worked behind the scenes to help Jews because direct intervention would have worsened the situation by prompting retaliations by Hitler. Benedict has repeatedly defended Pius, saying he worked "secretly and silently" during World War Two to "avoid the worst and save the greatest number of Jews possible." The Vatican says he saved several hundred thousand Jewish lives by ordering churches and convents throughout Italy to hide Jews and instructing Vatican diplomats in Europe to give many Jews false passports. This month, Amos Luzzatto, president emeritus of Italy's Jewish communities, said making Pius XII a saint could open a "wound difficult to heal" between Jews and Catholics. This month, a leading proponent of sainthood said the pope had halted the beatification process to avoid repercussions from Jewish groups. "The Jews have not recognized our Lord, therefore we cannot recognize the Jewish people." The image of a man who believes himself to be the Vicar of Christ, albeit falsely, showing obeisance before men who persist in their denial of the Sacred Divinity of Our Blessed Lord and Saviour Jesus Christ is an inversion of reality. Indeed, such an image is a precursor, at the very least, of the Antichrist. Our Lord was mocked before the Jews when He was tried before the high priest Caiphas. He is being mocked anew by the scions of the counterfeit church of conciliarism, starting with its Modernist head, Joseph Ratzinger/Benedict XVI. We must make many acts of reparation to the Most Sacred Heart of Jesus through the Sorrowful and Immaculate Heart of Mary for these outrages. This is a pretty good description of our present circumstances as formerly Catholic churches have been desecrated by the Protestant and Masonic Novus Ordo service (and its ever-mutating novelties and perversities, especially during "papal" "liturgies") and as obeisance is paid by conciliar officials to the agents of Satan who adhere to the Talmud. And it appears as though the Society of Saint Pius X will soon have the "privilege" of being a full partner (along with the "Catholic" Charismatic Renewal, Cursillo, Focolare, the Sant'Egidio Community, the Shalom Catholic Community, the Chemin Neuf Community, the International Community of Faith and Light, Regnum Christi, Communion and Liberation, the Emmanuel Community, the Seguimi Lay Group of Human-Christian Promotion, and. among many, many others, including the Neocatechumenal Way) in the One World Ecumenical Church that accords such "esteem" to the symbols and the representatives of false religions. We turn to Our Lady by means of her Most Holy Rosary to beg her to help us in this time of apostasy and betrayal. We pray our Rosaries each day as we offer up our meditations to the Most Sacred Heart of her Divine Son, Our Blessed Lord and Saviour Jesus Christ, through her own Sorrowful and Immaculate Heart in reparation for our own sins, which are so responsible for the state of the Church and the world, and those of the whole world. We know that Our Lady's Immaculate Heart will triumph in the end. Until that time, however, let us not take any chances with our immortal souls. Let us cling exclusively at all times to true bishops and true priests who make no concessions to conciliarism whatsoever and who accord the false shepherds of the counterfeit church of conciliarism no legitimacy at all, joining with our true bishops and priests as we pray for the conversion of these false shepherds to the true Church, the Catholic Church, from which they have defected and with which they are engaged, whether or not they realize it, in mortal warfare at the very behest of the devil himself. Saint Emeric (Americus), pray for us.